Porsche has been in her forever home since June 2016. 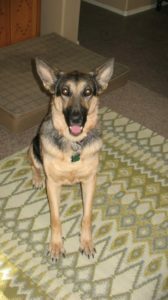 “I had rescued GSDs before and they had been abused, neglected and hurt. They were known as being fearful, scared out of their mind, not being able to be alone and more… How is it possible that a dog that is bred to defend us humans ends up like this? When I grew up in Vienna, Austria, during the aftermath of WWII, I had spent a lot of time alone because my parents had a difficult time surviving. Quite often, I went to the zoo to speak to someone, meaning ‘animals,’ sadly housed in cages. One day, I found a new member at the zoo, a small monkey, an ‘owner surrender.’ I put my hand into the bottom of the cage, the monkey took my hand…laid its head into my hand…and slept after I had spoken to him softly. It was not until 20 minutes later that he released my hand. He was lonely and sad. Last year, I was looking for another dog to offer me company and found Porsche through SPR. At that time, she had a temporary foster and had to be kept crated because there was another dog in the household. I agreed and found a loving dog, no manners and a bit pushy. Nevertheless, she had to be kept on medication. She too was an ‘owner surrender’ since she had seizures which made themselves known every two to three months. One week, she had had two attacks. It is a horrific thing to watch; the dog is motionless, the heart rate and breathing goes higher and higher which in, time, causes death. In addition, the dog loses its body fluid. Despite being told not to touch the dog during these episodes, at one time, when her heart sounded like a choo-choo train, I gently put my hand onto her head and spoke softly to her…she started coming back from this black-out. Often these events happened in the middle of the night. Since I am a light sleeper, I always woke up. The medication she took (Phenobarbital) did not seem to work for her and she acted spaced out. I kept wondering, where was the soul of this dog? The medication also affects the liver in the long run and I tried to find a better solution. With the help of several veterinarians, we put her on another medication (C-Potassium Bromide) but had to find the right measure. Now, a year and one half later, she has been ‘seizure free for five months!’ This does not necessarily mean that they won’t happen again. Now, finally talking about this sweetheart of a canine, the following are her attributes: confident, quiet, friendly, security conscious and she has an active nose. My backyard has walls on each side but she can smell when my neighbor is present in her yard. She is good with children when we are out on a walk and I educate them about this dog. She is very gentle with my three cats. As much as my two domesticated cats were a bit careful at first, the deaf feral cat that I found adopted Porsche as a mother. She awakens me, too early in the morning, with a kiss. I always have to tell her ‘…just a little bit of more time, please’ and goes back onto her blanket in my bedroom. I walk her twice a day most of the year but in the morning during summer. She likes to be out and walk. She would like to run but I am not so sure about her ‘recall.’ She likes to me to chase her…? One time when she got loose, I had to walk away for her to come back. She acts as she does not know how to play. She certainly is not a retriever. She possibly seems to have had some instructions to go for something above her…like a towel in my hand. She pulls it, has a tug war and then shakes it to death. The former owner’s vet referred to her as a K-9 dog? I had an opportunity to take her to someone in Queen Creek who has put up an agility course. Just with a little treat between my fingers she did everything the first time. This fall, I plan to attend a barn hunt where the dog has to find a safely encapsulated rat in the straw of a barn. She has such a good nose. Summers are difficult. My greatest wish would be for her to meet some other GSDs and play or go somewhere other than on asphalt. Otherwise, she has everything. Are you interested in helping with Porsche’s care? Visit her Amazon Wish List!